Planning a camping trip or a lengthy backpacking excursion? 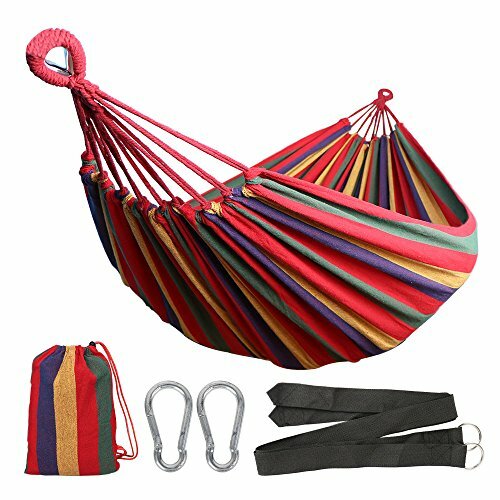 This light and portable hammock easily fits in your backpack. It folds into a compact size and comes with its own drawstring carry bag, so you can take it with you anywhere you want. Whenever you want to use, hanging it between two trees. Its durable and breathable canvas fabric makes it perfect for outdoor use. Isn't it beautiful lying in a hammock in the yard reading a book while enjoying the sunset scenery? This cotton hammock is also perfect for patio and garden use. Just fill your bathtub with cool water and about a quart of mild detergent, use your hands to wash it and scrub away the dirt on your hammock. Then rinse off the excess soap, repeat this step as necessary. Hang dry. Just add a little of dose of mild detergent and wash it in the gentle cycle. DO NOT add fabric softeners. Wash your hammock ALONE and DO NOT use bleach. Wash with COOL WATER ON A DELICATE LOW SPIN CYCLE. Hang dry. - Gross Weight: 3.7 lbs / 1.68 Kg.